Following the narrative of a 16 year old boy who lives on a remote island with his father, we discover the tragedies that occur and how the characters deal with these in their own separate ways. I had heard lots of good things about this novel so I decided to pick it up and, boy, am I glad I did! The characters in this novel were so unique. I loved seeing how the protagonist changed from who he was at the beginning and who he was at the end, and uncovering the mystery about his older brother was something I thoroughly enjoyed. I also found Frank's father to be quite intriguing however my opinion of him did change as I reached the ending. The plot line was amazingly written and full of constant intrigue. 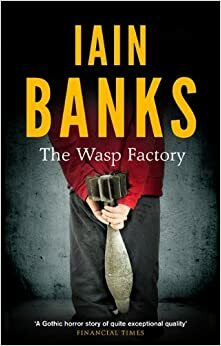 It's very twisted right from the first chapter all the way to the last paragraph and this is something not many authors succeed at, but Banks has done a phenomenal job and kept me hooked the entire way through. There is a fantastic twist at the end. As I was reading it, (the last sentence in particular) my jaw literally fell open because it was so unexpected; you wouldn't even be able to guess it! I'm not going to deny that this book is very messed up and could be quite disturbing for some readers. Sometimes I question how the author came up with something like this but I wouldn't change anything because it's one of the best novels I've read in a while! I'll definitely be checking out some of his other books!